I thought I’d take a slightly different approach to the best of list this year. So, instead of a standard Top 10 list as in prior years I decided to list just the Top 5 CDs of the year in order and the next best 5 in no particular order – the rankings after 5 has always been somewhat arbitrary and usually CD number 6 is as good as number 10 or number 9, so really it doesn’t matter and there are no prizes anyway. As always, it’s my list and I make the rules and will change ’em if I feel bloody well like it. 1) The Rumjacks: Gangs of New Holland – Gangs lives up to the promise of last years EPs and meets a very high standard. Uncle Tommy will be proud. 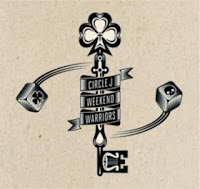 2) Circle J: Weekend Warriors – These guys came outta nowhere (well The Netherlands actually) – how could I have missed ’em before? 3) The Mighty Regis: 21 – A mighty CD from the Regis and good enough to be endorsed by Regis himself. 4) Flatfoot 56: Black Thorn – Here is a band that has gone from being the Dropkick Murphys kid brothers to towering above the crowd – both musically and literally (have you seen ’em they are big guys – except the bag pipe player). Kilmaine Saints: The Good, The Plaid and The Ugly – new band out of PA, and CD that just kept growing on me. Pipes and Pints: Until We Die – From the Czech Republic – punk and pipes as good as it gets. Black 47: Bankers and Gangsters – 20 years on the go and still quality and totally original. ‘cept the title but a song I keep playing. I’m drinking like Shane MacGowan on St. Paddys Day. I’m shooting up like Sid Vicious used to do. Continental – Rick Barton formally of Dropkick Murphys new band. I’ve seen’em live twice in 2010 and the are amazing. An EP is expected in 2011. The Mahones: Black Irish – I’ve heard it and its a contender for 2011 best of year. The BibleCodeSundays should also have something out in 2011, and hopefully stuff by the big boys – Flogging Molly, The Tossers, Dropkick Murphys.